What is the best bread knife? 4 When to cut bread after baking? Have you ever seen those cheesy TV commercials claiming such and such knife “even cuts through a can”? Well, who the heck buys a knife to cut a can? What’s important for a bread knife is how well it cuts bread, and our reviews will attempt to answer that. Since there are literally hundreds of models of bread knives for sale, it would be impossible for us to review each and every one of them. But if we combine our own experiences with that of other bread knife owners, we can definitely go over a few of the best models from “short” to “long” knives that we think would be worth the purchase. What’s considered a “short” or “long” bread knife? Why do you need a bread knife? And how can you sharpen one? We answered these questions in our blog post so be sure to check that out if you haven’t already. In our reviews below, we also include three metrics to rate the knives. Versatility is for how well it cuts things other than bread, Ergonomics is for comfort and how well the knife feels in the hand, and Performance is for how well and cleanly it cuts all types of bread. 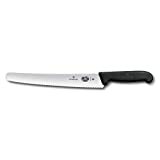 Known in North America as Forschner and widely as Victorinox (the makers of the Swiss Army knives), the first bread knife we want to take a look at is the Victorinox Fibrox Pro 10.25-inch pastry and bread knife. Forschner/Victorinox has a long history of making knives, extending back to 1884. So they really know what they’re doing. In fact Forschner/Victorinox is known for being the standard brand in the food service industry. The Victorinox Fibrox Pro 10.25 knife is actually marketed as pastry knife, but it works exceptionally well for cutting cakes, pastries, and bread of all kinds. The blade curves slightly to aid your cutting stroke and has a rounded tip. It can be used as a spatula for icing and slicing cakes. You can purchase this knife with a synthetic handle (dishwasher safe) or a rosewood handle (not dishwasher safe). Material: Stainless steel blade. Synthetic (TPE) or rosewood handle. Pros: A very versatile bread knife. Other than bread, it will slice your cakes, veggies, and even meats well. Given the well-made design, don’t be surprised that it doesn’t need sharpening even after two decades of use. Cons: This knife will have no problems cutting your bread machine bread. But perhaps because it doubles as a pastry knife, it may not work as well with thick-crusted artisan breads. That’s because the blade offers some flexibility. Shun is a line of high-quality kitchen knives owned by KAI group. This company originated from Seki, Japan, a city with over 800 years of history in knife manufacturing. Besides knives, the city has a long history of making samurai swords and is still known as the capital of samurai sword manufacturing. In other words, Seki takes knives seriously. They even have a Seki Cutlery Association and a Seki Swordsmith Museum. Knives that are produced here are as good as you can find anywhere in the world. 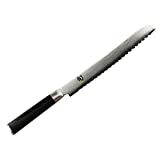 The Shun Classic 9-inch bread knife is made in Seki, Japan. Now that you know a little bit about Seki, we probably don’t have to convince you of the quality! Material: Stainless steel blade. PakkaWood (resin-impregnated hardwood) handle. Pros: Another versatile bread knife. Great for slicing your bread machine bread, baguettes, artisan bread, cake, tarts, cheese. It is forged with 33 layers of stainless steel to produce a gorgeous, rust-free Damascus pattern. So the knife is not only beautiful but practical and functional. Bonus point: You feel like a samurai using this knife. Cons: Kind of pricey. You’ll question your choice for spending more than you’d like on a bread knife. That is, until you use it! Then it will make more sense. Füri is a line of kitchen knives designed and manufactured by Australian company Füritechnics. They put engineering at the forefront when designing products so they make really beautiful and functional knives. While a relatively new and unknown brand, their products have been endorsed by chefs over its 20-year history, including Rachael Ray and Nigella Lawson. The Füri Pro 8-inch bread knife is one of the nicest bread knives we have used. It is made with a single piece of Japanese stainless steel. There are no seams and the construction is strong. This bread knife will certainly please the design and engineering enthusiasts. Pros: Durable design. Beautifully constructed. Easy to sharpen. Well-balanced in terms of strength and weight and feels good in your hand. It will cut your bread machine bread, of course, and harder breads like sourdough or rye. Because of the seamless design of this knife it is easy to clean and will hold up well for many, many years. Cons: If we had to nitpick, it would be ideal if the knife was just an inch longer. The story of Tojiro is similar to that of Shun’s. The company has roots in Tsubame-Sanjo, Japan – one of the country’s largest knife manufacturing cities since the late 1800s. Because they are not as well-known or as big as Shun internationally, Tojiro knives feel like hidden gems. Especially their bread knife: the Tojiro 235mm Bread Slicer, model F-737. Material: Stainless steel blade. Wood handle. Pros: Everything. We were able to pick this knife up for $20, and given the price we weren’t expecting much. But boy were we wrong. It easily beats out all of the $50-100 knives in terms of performance. If you’ve ever owned a Japanese knife, you will probably know that their sharpness can make one shiver. The Tojiro Bread Slicer is no different. It has an ultra sharp blade that is thinner than most bread knife blades but powerful nonetheless. If there was a cheesy TV commercial for this knife, it would definitely show the knife cutting through a can, nevermind all your bread. Cons: None. We can’t fault it. The blade length is at a sweet spot for most people. The price is unbeatable. And the knife feels great in our hands. We give this knife 5/5 stars in our review. It is truly one of the best things we have ever bought. You probably know the German knife maker Wüsthof, so we’ll skip the introductions and jump right into the knife we want to show you. The Wüsthof Classic 10-inch bread knife is one of the best long bread knives we have used. It is made in Germany with German stainless steel. So you can expect reliable German quality. Material: Stainless steel blade. Synthetic polyoxymethylene (POM) handle. Pros: As a bread knife with longer blade, the Wüsthof Classic 10-inch bread knife works well with a bread slicing guide. It cuts easily through thick, hard crusts and produces minimal crumbs. It is also capable of handling all sorts of foods. Cons: Kind of pricey. You’re paying for German quality. But for for roughly the same amount, our hearts lean towards the Shun if we had to pick between the two. One more thing: Are you thinking that we missed a knife that should be on this list? What about a Zwilling bread knife? Or, as some of you may know them, a Henckels bread knife? We didn’t omit them. We just didn’t think they were the best of the best. Please keep in mind that choosing a bread knife is quite a personal experience. What works for some people may not work for others in terms of budget, feel, or design. We wanted to only review and include those we thought warranted a recommendation. And of course, there are hundreds of bread knives so it’s not impossible that we missed one. So if you think you found the best bread knife, tell us which one in the comments below! To round out our bread knife reviews, we want to tell you what’s the best bread knife based on your needs. For example, do you need something that’s affordable? Do you need something that’s short? Do you need something that’s long? What’s the difference?! When you go around shopping for a bread knife you will hear these two terms thrown around interchangeably. That’s because sometimes bread knives double as pastry knives, and vice versa. The easiest way to tell if your bread knife is also a pastry knife is by looking at the tip of the blade. If it is broad like what you see with the Victorinox Fibrox Pro then it works as a pastry knife. The broad blade allows you to use it like a spatula or palette, intended for spreading icing on a cake for instance. Or transferring sliced cake. When to cut bread after baking? We’re pretty sure we mentioned this somewhere before, but we’ll provide a little reminder and try to expand on what we’ve said. After your bread is done baking, take it out of the bread maker and allow it to cool on a rack for at least 1 to 2 hours before slicing into it. Cooling it will allow unwanted moisture to escape and the starch to set. When you cut cooled bread you’ll be able to achieve even slices and the texture will be optimal for spreading things or making sandwiches. Some breads (like rye) will need to rest overnight to cool before slicing. Of course, if you’re not looking to cut the bread you can simply rip into it when it’s done baking. You’ll definitely notice a different texture. We hope there’s a bread knife above that will meet your needs. If you are looking for something with a particular feature or combination of features that you do not see on this list, please let us know in the comments below and we’ll try to come up with some suggestions for you!